Perfect for the public domain, stadiums and conference venues, the Video Wall is highly visible not only to passers-by but to people across the street. Install a Video Wall and your customer base will be coming at you from all directions. What can the Video Wall do for you? • Generate revenue through advertising. • Promote YOU and make your business really stand out. • Communicate your message in a visually appealing way. • Grab the attention of a large crowd at a distance. The Video Wall is built using a series of interconnected LCD/LED screens linked to a computer network. Specialist software enables you to upload your message, video or graphic via a single desktop or laptop computer. If you’re time poor or lacking creative inspiration we can help you develop and produce a professional marketing message, or video presentation to engage your target market. 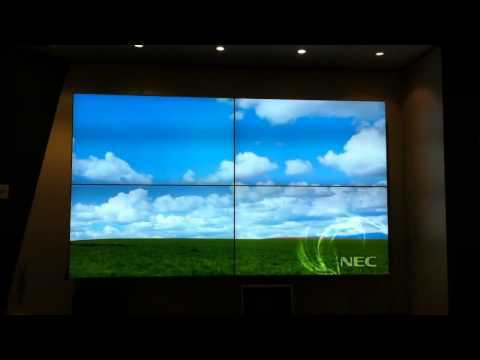 One important feature of a Video Wall is the resolution that can be achieved. The Video Wall is configured so the HD resolution is multiplied and not divided and stretched. The result is high definition images or videos being shown in TRUE HD/FULL HD. Check out our other Interactive Touch Table, YourWall and YourWindow interactive technology. • Offers a full colour multi-screen content display system. • Is cost effective – the initial infrastructure investment is easily recovered based on reduced labour and printing expenses (associated with traditional ‘static’ advertising). • Delivers a big-screen experience without compromising the resolution/pixel density. • Allows you to instantly upload and update content at the last minute. • Uses specialised software that can be tailored specifically to meet your multimedia advertising, marketing or general business needs. • Can incorporate Touch Technology - Touch Foil or IR Touch Frame. • Can incorporate Augmented Reality Technology. • Can be purchased or rented.